The Key to Passing the CA Bar on Your First Try? 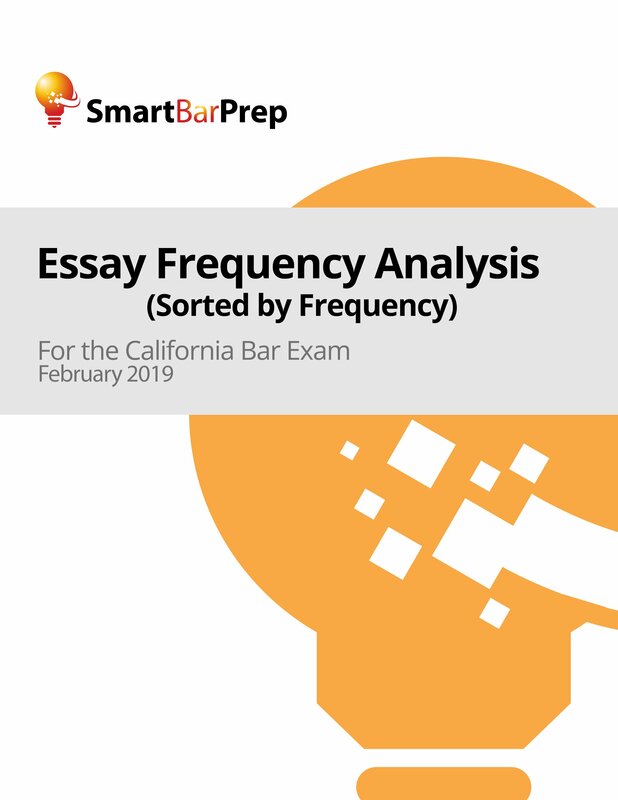 SmartBarPrep’s Essay Priority Outline is the most Efficient and Effective Way to Study for the California Bar Exam Essays. Are you avoiding studying for the essay portion of the California Bar Exam because it seems harder to prepare for than the MBE and Performance Test sections? DON’T. You’re risking failure, and avoidance really isn’t necessary. This study guide simplifies the preparation process by showing you how to focus on the rules that are most frequently tested. 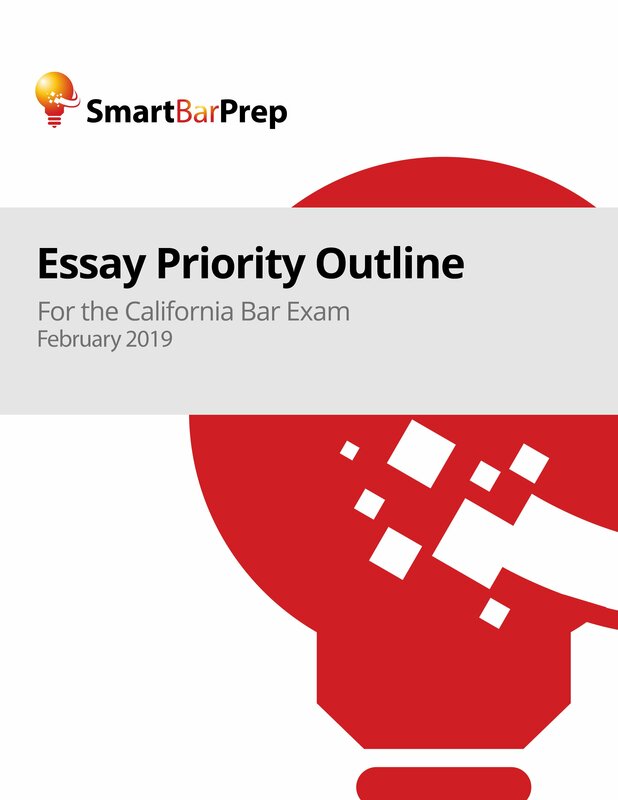 The SmartBarPrep Essay Priority Outline contains model rule statements to ALL 517 RULES tested on the California Bar Exam essays in the last 35 examinations…AND reveals how often each rule has appeared in the past. That is an extraordinary 18 YEARS of exams and 207 ESSAY QUESTIONS analyzed for your advantage. Pre-Order the July 2019 California Essay Prep Outline Now! The updated July 2019 California essay study guides will be released sometime between mid-May and early-June, depending on when the most recent exam is released. Click here to be notified when the July 2019 California bar exam materials are released. 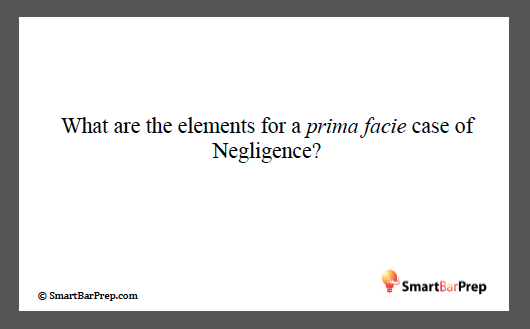 Our answer, SmartBarPrep’s Essay Priority Outline, is based on the analysis of past California (CA) Bar Exams. It would take you over 1,000 hours of reading, analyzing, compiling, and drafting to equal the information at your fingertips in this study guide. Written so it’s simple to understand. 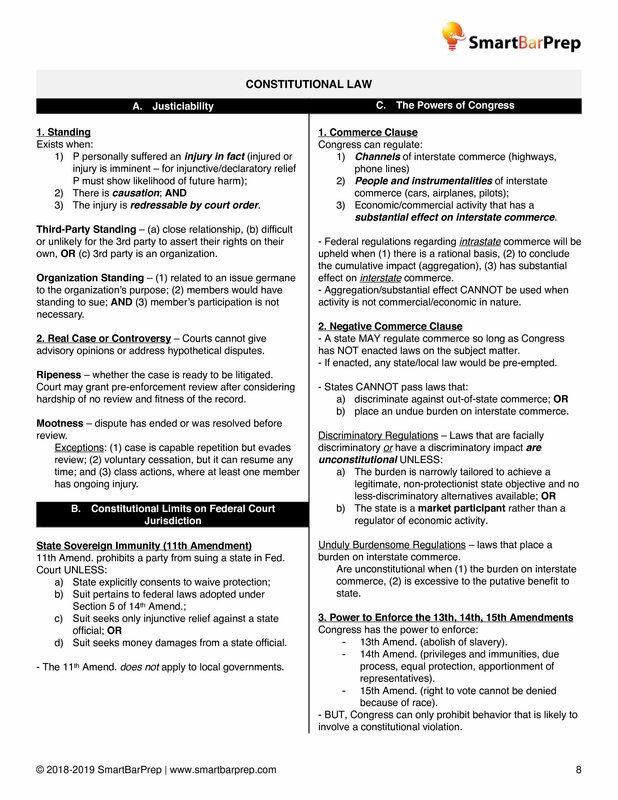 UPDATED specifically for the February 2019 bar exam with the most current law. UPDATED to reflect: (1) the new CA Rules of Professional Conduct effective on Nov. 1, 2018; and (2) the Aug. 2018 changes to the ABA advertising rules. Analyzed for its FREQUENCY (how often each rule has been tested in the past so you can prioritize and study the most frequently tested rules first). That frequency is shown next to each rule. 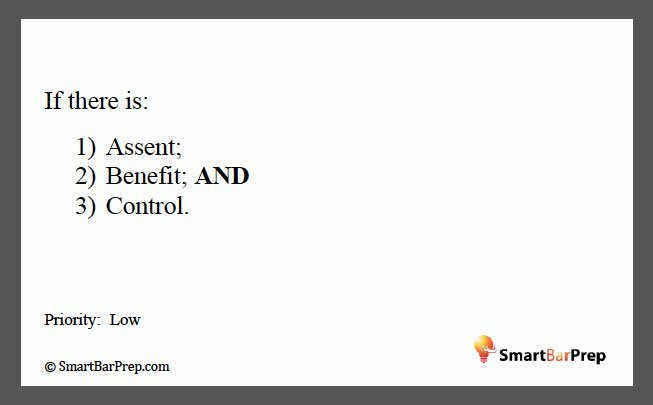 COMPREHENSIVE AND SUBSTANTIAL: SmartBarPrep’s Essay Priority Outline has over 150 pages of substance (no fillers, no frills). 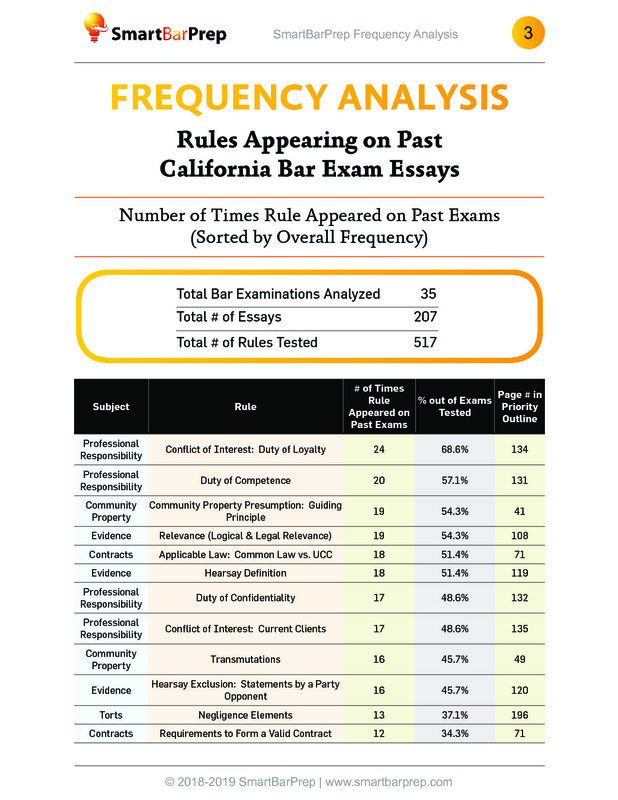 It covers ALL 16 subjects tested on the essay portion of the California Bar Exam. 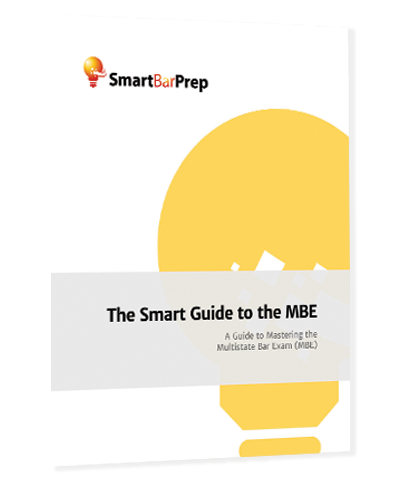 This study guide can be used to supplement bar exam review courses such as BarBri or Kaplan. 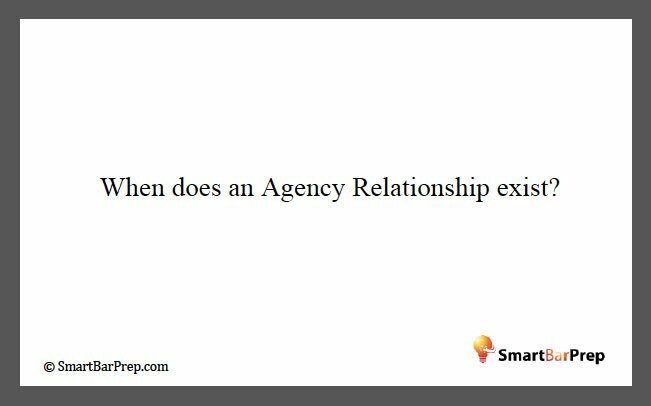 The SmartBarPrep Essay Priority Outline integrates well with review courses because it is arranged in terms of frequency and topic, saving you the hassle of making index cards or other outlines. The SmartBarPrep Essay Priority Outline is valued at $200, but right now it is $124 – a savings of more than 30%. If you are like most preparing for the California Bar, you have spent thousands on a bar review course. In comparison, this outline is truly a remarkable value. BONUS #1: Essay Frequency Analysis (Sorted by Frequency) that contains charts of the rules tested ordering the rules from the most tested to least tested BOTH by overall frequency and also by frequency within each subject. 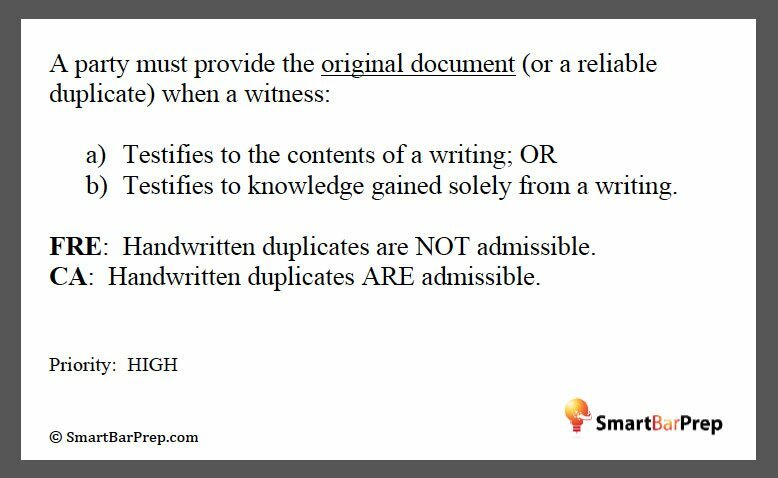 These charts also contain cross-references to the page numbers where the rules appear in the SmartBarPrep Essay Priority Outline. 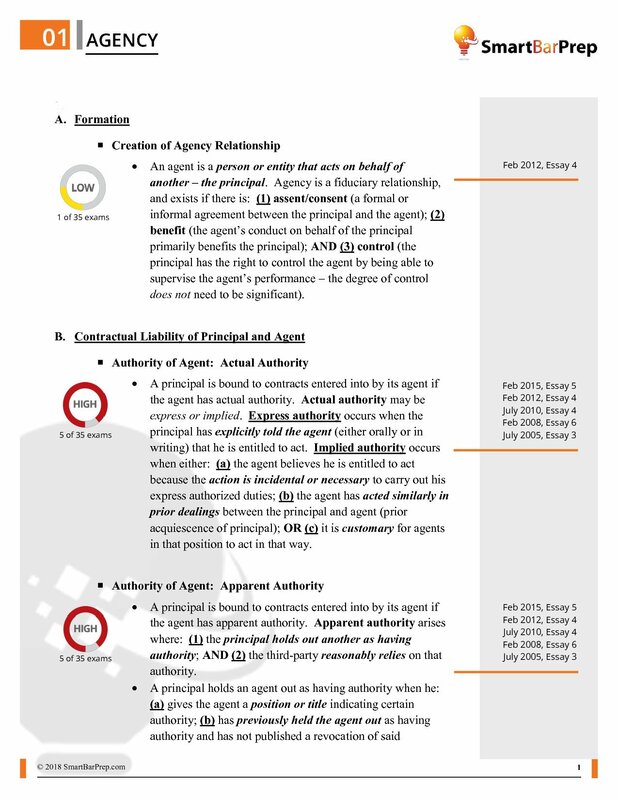 BONUS # 2: Separate HIGH, MEDIUM, & LOW Outlines of the rules in the SmartBarPrep Essay Priority Outline. These outlines separate the rules under both classifications, and enable you to even further focus your studying, especially in the weeks right before the exam. MBE Condensed Attack Sheets that are 4-7 pages per subject so you can quickly review the most important MBE rules. 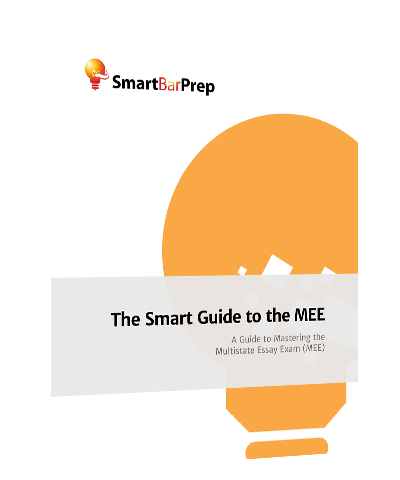 The attack sheets contain condensed breakdowns of the rules tested on the MBE section, and enable you to even further focus your studying, especially in the weeks right before the exam. MBE Digital Flashcards: Includes over 370 digital flashcards to help you memorize the rules tested on the MBE section. The flashcards can be used to reinforce your knowledge of the rules tested on the exam, and can be used on your phone or tablet to review rules on-the-go! These digital flashcards are downloadable in PDF format, and instructions are included to load the flashcards onto your iPhone, iPad, or Android device. California + MBE Digital Flashcards: Includes over 740 digital flashcards to help you memorize the rules tested on both the California essay and MBE sections. 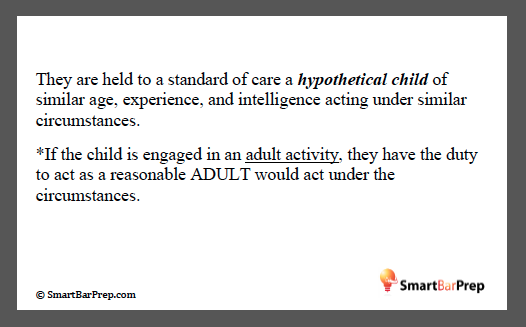 The flashcards cover all 16 subjects, and include High/Medium/Low priorities for the rules previously tested on the CA essays. Here is a breakdown of the Standard, Deluxe, & Ultimate Packages. We are a firm believer in the 80/20 Rule developed by Italian economist Vilfredo Pareto. In short, the rule says that in almost anything in life, only a few things (the 20 percent) are essential and the rest (the remaining 80 percent) are trivial. Sounds like a nice theory, but can it be applied to the California Bar Exam essays? It does, and our team of California attorneys proved it. We rolled up our sleeves and went through every shred of material released by the California Committee of Bar Examiners to see if our theory was true. After going through every item they released in detail, we noticed patterns emerge. The most noticeable was that the bar examiners tested some material more frequently than others. 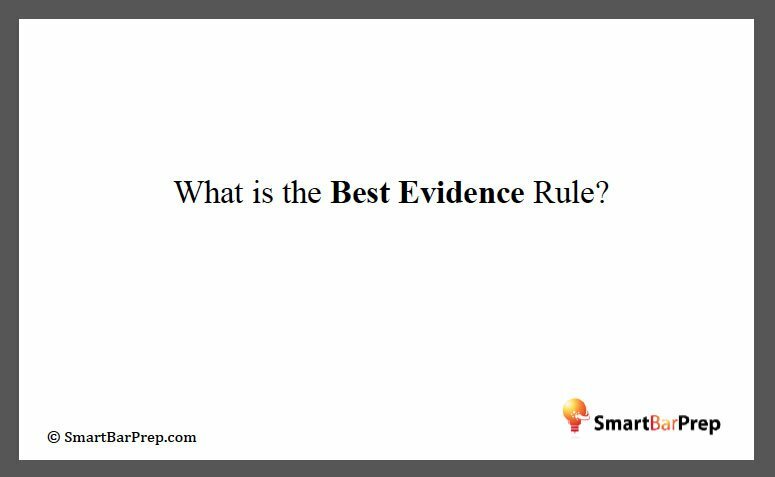 For example, whenever a evidence question appeared we found that over 80% of the time a component of the question dealt with the General Hearsay Rule. Since this rule is tested frequently, it makes sense to spend more time memorizing it than, say, the rule of Prohibition Against Jury Investigations, which appeared only once in the last 18 years. Also in line with the 80/20 Rule, focusing 80 percent of your time and energy on the 20 percent of the rules of law that are tested most frequently will maximize your chances of passing. Don’t just work hard; work smart by focusing on the right things. That is exactly what the Essay Priority Outline does: It tells you what is most important and where to focus your efforts. Sure… you can see samples of our California bar exam study materials here.